Have you ever taken a photo with a long zoom lens where you thought your technique was perfect, only to come home and see a image that is mushy and and seemingly out of focus? Moonrise over Seattle and the Cascade Mountainss ruined by strong heat distortion when cold air above the waters of Puget Sound mixed with warm air on a summer-like winter afternoon. 500 mm, 1/3 sec, f/10, ISO 80. This happened to me when shooting a moonrise over Seattle this week on an abnormally warm winter day. There was nothing wrong with my lens, focus or tripod support, but the big temperature difference between the cold water of Puget Sound (~47 °F) and an very warm air (~75 °F) caused heat distortion that ruined my photographs. You’ve probably seen heat distortion on a hot summer day, where there are waves of heat rising from a road. Or perhaps you have seen it in the exhaust from a boat, train or airplane. Years ago when I first came across it in my photos, I thought it was either something wrong with my technique or equipment, but no amount of fancy gear or flawless camera technique can fix photos ruined by heat distortion. I shot this photo of Seattle’s Space Needle at sunset this week. My 500 mm lens is razor sharp at distance, the camera was in perfect focus and was on a sturdy tripod with the shutter triggered by a timer. Both the equipment and technique were perfect, but the resulting image is a squishy mess. Strong heat distortion of Seattle skyline taken from over 7 miles of water. Air temperature ~ 75 °F, water temperature ~47 °F. 500 mm, 1/400 sec, f/9, ISO 1250. When will heat distortion occur? Heat distortion is caused when light is refracted through air of differing densities. Hot air is less dense than cold air, so light waves are bent differently in hot versus cold air. The result is visible heat waves when there is a significant temperature difference between the ground and the air above it. On a hot, sunny summer day, you will see this above roads, but it can occur on just about any land mass where the sun heats the ground to a temperature higher than the surrounding air such as an open field or beach. Bodies of water can cause the exact same phenomenon when the water is either significantly warmer or colder than the air above it. A warm ocean with cold air above it may show heat distortion and so will a cold ocean with warmer air above it. Cold 38 °F air over Puget Sound at 50 °F causes heat distortion. Heat distortion is not restricted to hot summer days. It can also occur in arctic temperatures during winter where the sun warms the land or mountainside to a temperature well above the air temperature. The further away the subject of your photograph, the more heat distortion will be present. The further distance means that the light is travelling through more air before it reaches you, therefore it gets refracted more in areas where heat distortion is present. A long zoom lens usually means you are trying to photograph subjects at a greater distance. That greater distance increases the chance that heat distortion can ruin your images. Heat distortion is most prevalent at ground level. Heat distortion is more prevalent near ground level. Notice the strong heat waves above the water, but a sharper view of Mt. Rainier above those heat waves. Zoom lenses have the added disadvantage of bringing the detail of the heat waves closer, making the result larger and more obvious in your photo. Photographers who spend more than $10,000 on a monster 600 mm or 800 mm prime lens will want to remember this before getting angry and wanting to send the lens back for repairs. 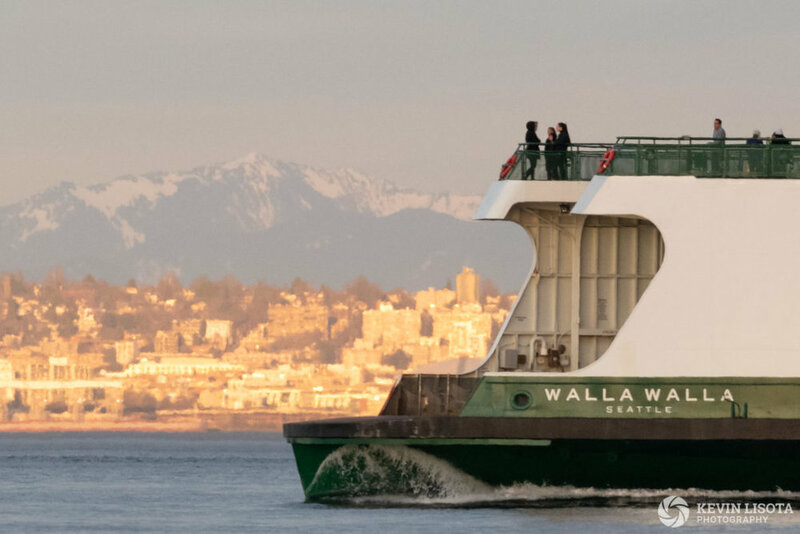 This photo shows a ferry that is ~1 mile away from my camera, taken at 200 mm. Focus was perfect on the ferry, but there is some softness due to heat distortion. The city in the background is ~7 miles away. The heat distortion is very severe at the greater distance since that light has to travel through more refracted air. Heat distortion is slight on the ferry 1 mile away, but severe on the city that is 7 miles away. 200 mm, 1/320 sec, f/9 ISO 1250. How can you avoid heat distortion? In many cases, heat distortion is unavoidable and there is nothing that you can do to fix it, but there are a few different ways to avoid it. Move closer to your subject. Reducing the distance that light travels through the refracted air will reduce the amount of heat distortion that you see in photographs. Avoid photographing over surfaces that are easily heated up by the sun, such as a road, beach or similar. Shoot near sunrise before the ground has heated up or near sunset once the ground has begun to cool. There is less or no heat distortion during these times. If photographing over a large body of water, try to take photos when the air temperature is similar to the water temperature. Soft, out-of-focus images can be caused by poor technique or the wrong camera settings, but once you have ruled those out, don’t forget about heat distortion.